It was a round of Twenty20 action that simply had it all, centuries, class bowling and fielding, a draw, and even a mankad. 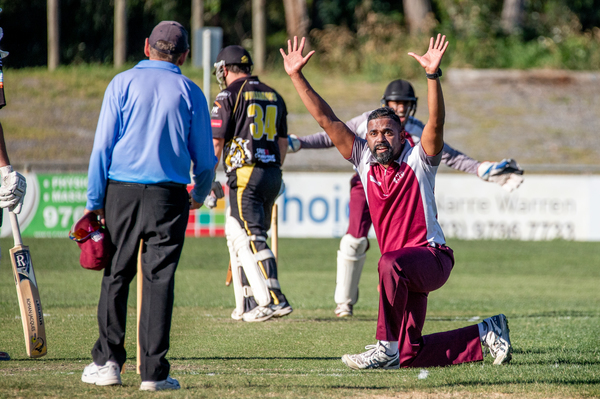 In a battle of the two undefeated sides in Group C, North Dandenong and Beaconsfield at Perc Allison Oval on Wednesday 5 December, it came down to one final controversial moment off the last ball of the match to decide the result. With one to win, one wicket left and just one ball remaining, the Tigers’ gun all-rounder Matt Golding mankaded the Maroons, and the umpire subsequently raised his finger, much to the displeasure of the visiting side. A mankad – being the bowler running out the non-striker for straying outside of his crease during his run-up – is arguably the most controversial mode of dismissal in cricket. But skipper Alex Roberts withdrew the appeal after realising that Maroons were only playing with 10 players, and the visitors eventually hit a two of the final ball to secure the points and remain undefeated. After winning the toss and batting, the Tigers scrapped their way to 6/127 off their 20, with Golding (78 not out) the only batsman to really get going, with Matin Sultani (1/27), Austin Heldt (0/12), Asfan Thajudeen (1/19), Akshay Ballal (2/38) and Muharjithan Thedchanamoorthy (2/28) doing a fine job against a quality middle order. Heldt (23) and Ballal (46) combined nicely after the loss of an early wicket, before the home side pegged things back through the efforts of marquee Fred Klaassen (2/15), Roberts (2/28) and Callan Tout (2/28) but managed to bring the game to the final over, where they eventually got the job done. Elsewhere, Buckley Ridges all-rounder Susa Pradeep went berserk, compiling an extraordinary 130 not out as the Bucks eased past Lynbrook at Park Oval. Pradeep showcased his abundance of class to walk off the field with 12 fours and 10 sixes in a 64-ball epic, including 33 off the final over, as the ball flied to all parts, and even hit a car side mirror. It’s Pradeep’s first Twenty20 century at the club, and his third overall down at Park oval. Out of his 130, 108 came in boundaries. His side eventually finished off with an ominous score of 5/200, with the Lakes scoring 6/112 in reply. Kaushalya Weeraratne also belted a ton for Heinz Southern Districts in a thumping win against Silverton. The star Sri-Lankan was in imposing touch against the Bakers with a glorious 117, with the Cobras racking up 4/226. Weeraratne’s brutal innings featured nine fours and nine sixes. Michael ‘Slick’ Davies also crunched 43, as he continues his brilliant form. The Bakers offered little resistance with the bat despite Dale Weston scoring 37, with the Cobras skittling the visitors for 82. Jack Philpin (2/13), Davies (2/13), Suraj Randiv (2/4) and Craig Milne (2/8) all took multiple wickets. Craig Slocombe also wound back the clock in a vintage display for Springvale South against Parkmore Pirates. The Bloods legend churned out a brilliant 97 before being bowled, including five monster sixes down at Alex Nelson Reserve. In his first Twenty20 of the season, the champion bat was in no mood to waste time, helping his side to 5/187, with Malinga Bandara (36) and Brayden Sharp (31 not out) also in the runs. The Pirates were undone by a brilliant spell by Andrew Staude (3/8) and marquee Akshat Buch (2/23), restricted to 9/94 off 20 overs. In other matches, Narre South (1/64) thumped Parkfield (60), St Brigid’s/St Louis (2/120) had the better of Springvale (114), Narre Warren (8/119) and Cranbourne (119) drew, Berwick (3/100) eased past Doveton (5/99), Mordialloc (3/99) defeated Doveton North (8/97), Dingley (6/131) beat Berwick Springs (7/128), St Mary’s (5/137) were too good for Dandenong West (9/73), and Narre North (6/139) upset Hallam Kalora Park (5/135). With one round of the Twenty20 home and away season left, the top eight sides are: Berwick, Springvale, Springvale South, Mordialloc, North Dandenong, Heinz Southern Districts, Buckley Ridges and Narre South. The final round before finals will be played on 19 December.